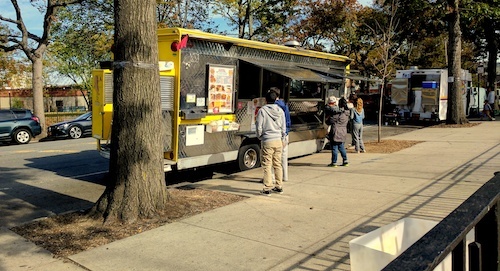 Despite all their success (well-earned it must be said), the vendors lining the intersection of Clinton and Bay in Red Hook still remain affable and charming, humbly offering their foods each weekend during warm months, from the end of April to October. It's a tradition that has lately caught in with the "in" crowd, but no matter, the food is still top notch. Get their by noon and one or two trucks might still be setting up, but you'll beat the crowds and maybe enjoy a word or two with the proprietors. Recent Vendy award nominees "Country Boys"
The corner is lined with trucks and still a few small carts, selling ceviches, pupusas, tacos, and all the rest. The Country Boys truck (above) is usually the most crowded, and for good reason, they know how to cook. 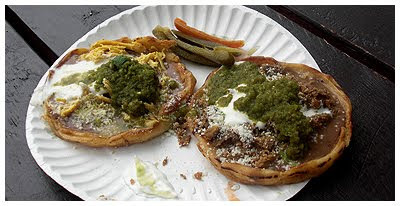 I especially like their sopes ($6 for 2, below), which are molded into a small plate-like shape with edges to hold in the beans. The corn base is also crispy, something of a rarity in the sope world, but a very good change. They also make a mega quesadilla ($6, below) that when picked up starts dripping and breaking apart immediately. Keep your wits about you though and munch fast, making sure to pick up all the juicy remains. 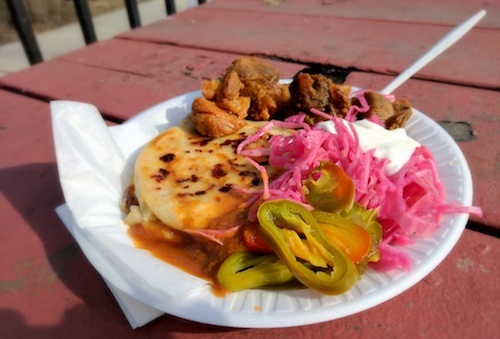 There are two competing (Actually they are all friends, and Vendy winners) Salvadoran pupusa trucks, both with similar offerings and pricing. I don't remember which, but one of them sets up camp over at Brooklyn Flea on Saturdays, one of two locations that the vendors have expanded to this year. You can also find some random offerings there too, but fighting the hipster mob is kind of defeating sometimes. Back at the ball fields, I always like to grab my food and head for the opposite side of the soccer pitch, where families of the players gather with children and music to watch or not watch the games. It's more festive, and it's even fun to watch the players strut their stuff on the field. If you are lucky enuogh to see a score, a nice show usually follows. From the sound of their social media, not all is well in Red Hook. During the years when the vendors were all the rage, they spent money renewing permits, upgrading trucks and equipment, etc., and now that their "hipster moment" has passed, it seems they are struggling for business. My visits the past couple years have seen no lines or waiting, especially after the leagues have finished for the season.